Eltham was first recorded in Domesday Book and its name could relate to a man called Elta, or to the Old English word ‘elfitu’, a swan. Plantagenet kings chose Eltham as a place of rest en route to and from France and converted the manor house into a moated palace in the 14th century. In the 1470s Edward IV added a great hall for royal banquets. For reasons not known, Eltham was partic­u­larly popular as a place for the royal families to spend Christmas. The Tudor monarchs preferred Greenwich and Eltham Palace declined in the 16th century and was ransacked in the Civil War. The trees of the palace’s three parks, Great Park, Middle Park and Horn Park, were cut down and used for shipbuilding. After the Restoration the vintner and influ­ential financier Sir John Shaw leased the Great Park and built Eltham Lodge in 1664. He did not attempt to rescue the palace and the great hall became a barn. The park is now Royal Blackheath golf course and the lodge is its clubhouse. The parish of Eltham had 30 other houses in the early 18th century but little trace of these remains. The High Street gained some charac­terful premises later in that century, of which a few survive, notably the Greyhound and Rising Sun inns. The arrival of the railway at what is now New Eltham brought early suburban devel­opment to the south-east in the 1880s but the land north of the palace remained in agricul­tural use until 1900, when Cameron Corbett began to lay out the Eltham Park estate. To its west, the Ministry of Works built housing for Woolwich Arsenal munitions workers at Well Hall during the First World War. Woolwich council subsequently built the Page, Middle Park, Horn Park and Coldharbour estates, while private developers capit­alized on the construction of Rochester Way, providing homes for the new car-owning classes. During the 1930s Sir Stephen Courtauld leased the site of Eltham Palace, repaired the great hall and built a new house for himself and his wife Virginia, with lavish art deco interiors. The buildings were magni­fi­cently restored by English Heritage in the 1990s and opened to the public. A tragic event elsewhere in Eltham sullied the town’s reputation in 1993, when black schoolboy Stephen Lawrence was murdered in a racist attack. Two of the original suspects were eventually convicted of murder in 2012. The Flemish artist Sir Anthony Van Dyck spent one or more summers at Eltham Palace in the 1630s and painted several of his greatest works here. 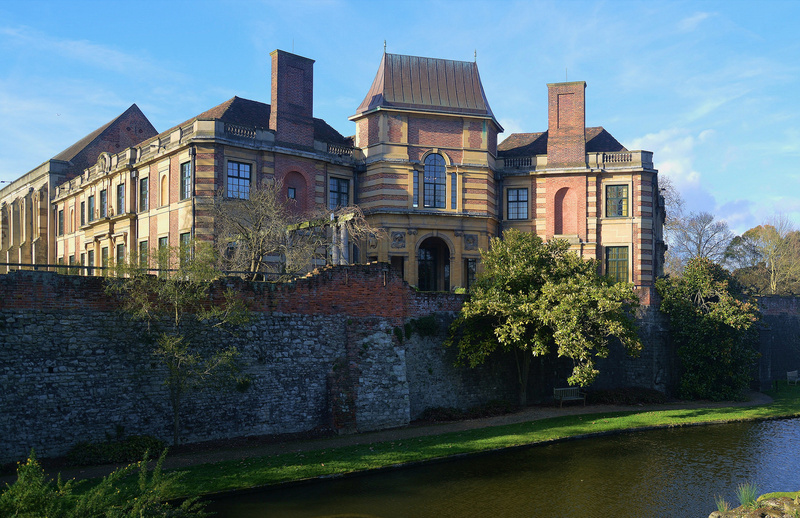 The photograph of Eltham Palace at the top of this page was taken by Barry Marsh, posted at Flickr, and released into the public domain.